Iris 02 takes inspiration from the track ‘Blue Calm’ which was written by jazz musician Trish Clowes specifically with the multifaceted Iris in mind. The painting considers the dimensions and symbolism of Iris, the Greek rainbow Goddess of the sky and the sea, and messenger of the Gods. 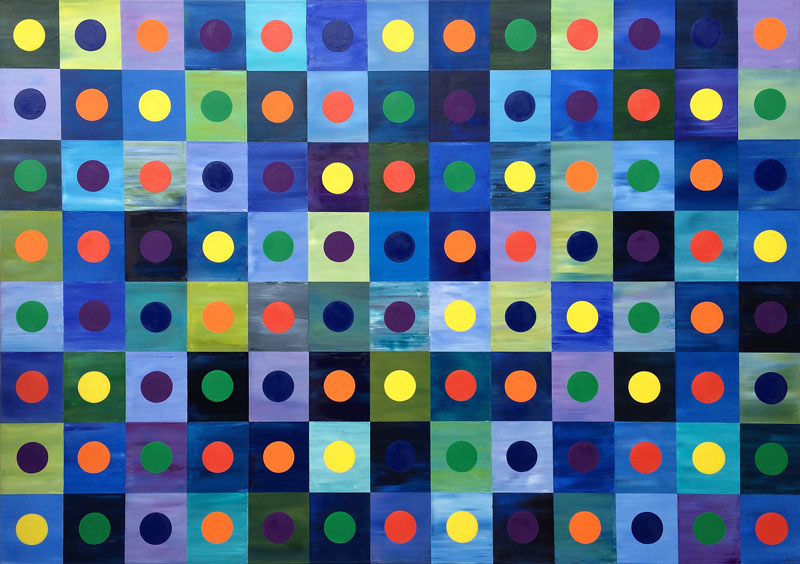 The artwork echoes this division of sea and air within its structure - the underlying base grid of the painting gives a sense of the soft and lyrical with its thick textured oil paint and varied shades of blue that contrast with the harder edged circles. As a gay artist and activist it was vital to Ash to connect the rainbow of Iris to the rainbow pride flag. Both are multifaceted and represent diversity, hope, and social action. Consequently, the spots are limited to six colours; this gives the artwork impact and a greater sense of depth and passion.